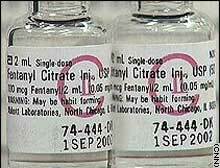 Fentanyl is a potent narcotic used for anesthesia.  Your Say: Did Russia get it right? Potent opiate-based narcotic used for anesthesia. Usually administered intravenously, through a patch, with an injection, or orally in the form of a lollipop. When used as prescribed helps cancer patients and chronic pain sufferers manage their pain. Effects include euphoria, drowsiness, constricted pupils, nausea. When combined with other depressants can lower respiratory system enough to kill. Taken in high doses, Fentanyl alone can kill. MOSCOW, Russia (CNN) -- Four days after Russian forces used anesthetic gas to end a hostage standoff by Chechen rebels, Russia's top health official identified the main component of the gas blamed for the deaths of 117 hostages. The gas was based on derivatives of fentanyl, Health Minister Yuri Shevchenko said Wednesday. Fentanyl is an opiate-based narcotic 100 times more powerful than morphine, according to the American Society of Anesthesiologists. It is used for pain relief in surgeries, and is the most common narcotic used for anesthesia in surgeries done in the United States. Fentanyl can cause extreme drowsiness, but American anesthesiologists do not use it in doses meant to put patients to sleep. It's used in the United States to stop breathing during surgery when breathing is mechanically supported. In high doses it can not only knock people unconscious but also cause them to stop breathing. The Centers for Disease Control and Prevention says in such doses fentanyl can be fatal. Other potential side effects include liver, heart, and kidney problems as well as nausea and vomiting. A person who vomits while unconscious may choke -- another way fentanyl can lead to death. One reason Russian forces used derivatives of fentanyl probably was how quickly the drug works. "People have less time to react," Dr. James Cottrell, president of the American Society of Anesthesiologists, told CNN. "It kicks in within a matter of minutes." Russian officials have said use of the anesthetic gas was necessary to "neutralize" the captors, who were strapped with explosives and threatened to kill everyone. Russian President Vladimir Putin said Russia's operation "managed to do the impossible" and save most of the 800 hostages. However, Cottrell said use of a gas based on derivatives of fentanyl runs serious risks. "If you blast it into a room ... you have no idea how much is going to go into the person's system." The effect on each person would depend on where he or she was sitting in relation to vents and other factors, Cottrell said. Shevchenko did not state exactly what was in the gas that Russian forces used. But he insisted "by themselves, these compounds cannot provoke a fatal outcome." He said the deaths resulted because the gas was used on people who, after a 58-hour standoff, were already suffering from lack of movement, hunger, dehydration, lack of oxygen, and severe stress. Shevchenko also said use of the gas did not violate the international convention banning the use of chemical weapons. Russian officials had refused to identify the gas used, saying the information in the wrong hands could endanger innocent people. But international pressure mounted. Political leaders both within Russia and around the world have said more of the hostages might have been saved if doctors and others had known sooner precisely what kind of gas was used. Shevchenko denied the charge. "Specialists, in particular myself, had been warned even though the operation had to be carried out on short notice," he said. Medics had prepared more than 1,000 doses of the appropriate antidote, he said. White House spokesman Ari Fleischer said Tuesday "the president feels very strongly that responsibility for this [the hostage deaths] rests with the terrorists who took these people hostage and put them in harm's way in the first place." Captors shot and killed two hostages before elite Russian soldiers stormed the theater. In addition to the 117 deaths due to complications stemming from the gas, hundreds more of the hostages were hospitalized. Wednesday's disclosure from Russian authorities followed a statement from a German medical expert who said he believed Russian forces used a different anesthetic gas called halothane after finding traces of that drug in two survivors. Alexei Arbatov, head of the Russian parliament's defense committee, told CNN Monday that the government's alleged failure to tell doctors what antidote to use on victims had been a "great blunder" that should be investigated. Doctors treated survivors with various remedies -- finally settling on narcan, which is used for countering the effects of heroin and a variety of morphine-based medications. The rebels threatened to blow up the building and kill everyone inside if authorities attacked, or their demands to end the war in Chechnya were not met, and had rigged the theater with explosives.